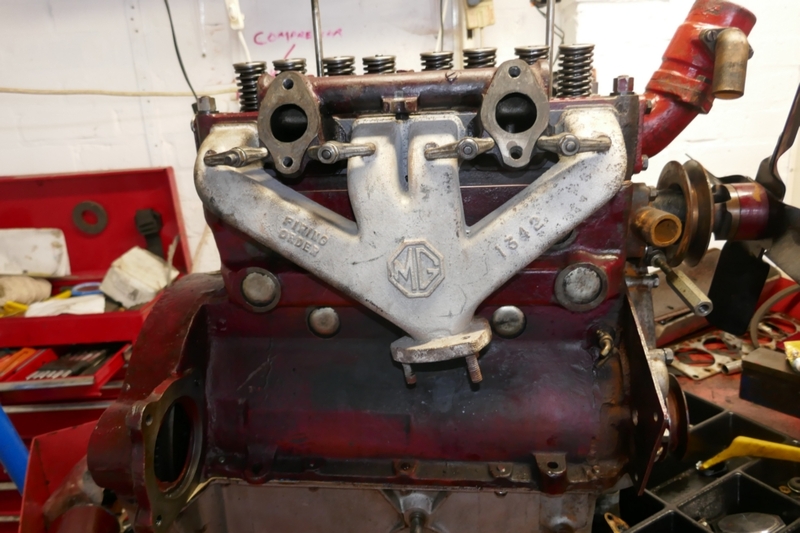 On April 1st a friend brought his rare MG YT to me for me to rebuild his engine. 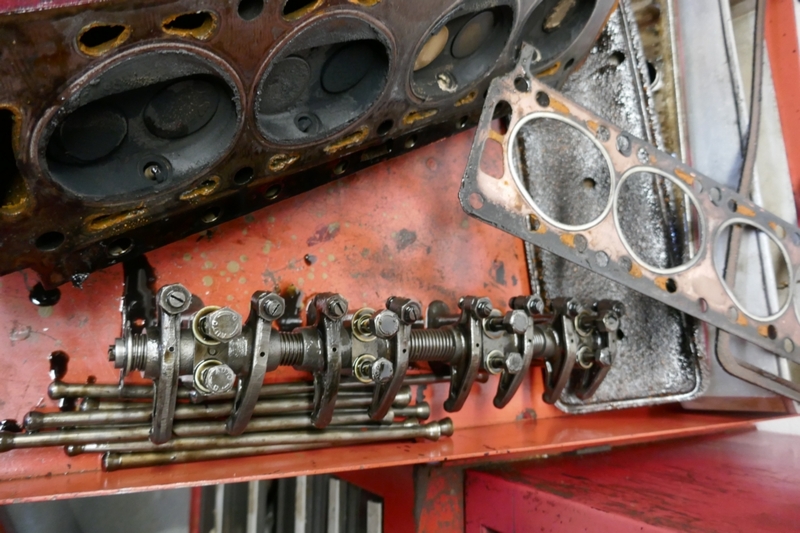 The following is a record of the engine rebuild. 1st April.2019 Jerry arrived about 1630. We got the car in and up on axle stands front and rear and drained the oil. I fitted a drain pipe to the rad tap but it wasn't a good fit so we ended up with the contents of the rad over the floor. When I packed up for the night I laid some old towels down to soak up all the water. First off was the bonnet, it's much heavier than a TC bonnet but off it came. 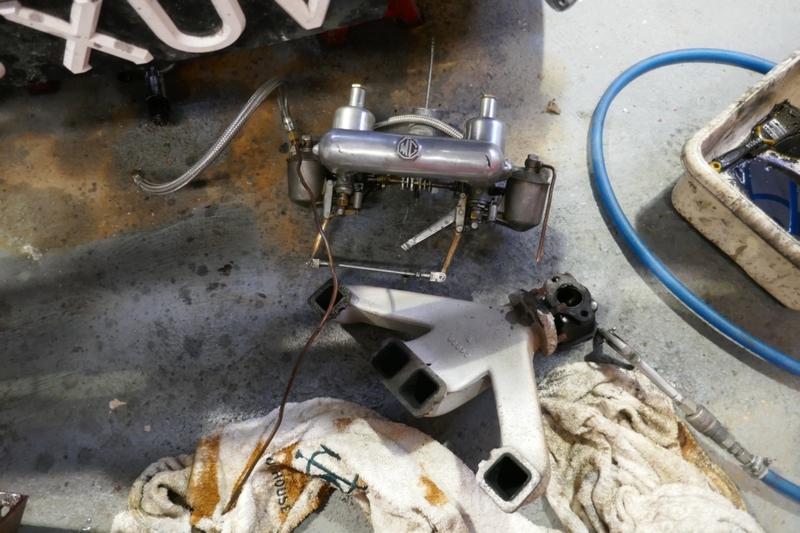 Then we got the wires from the distributor and dynamo off, the oil pipe from the block off and the carb throttle and choke cable off. That was it for the day. 2nd April 2019 We got up at 0730, had breakfast and I took Jerry to Sheffield station so he could go home.I got back about 1130 and felt cold and tired (hadn't had a good nights sleep) so went to bed for an hour or so. Had lunch and started on the car. Rad out which also means taking the headlights off. 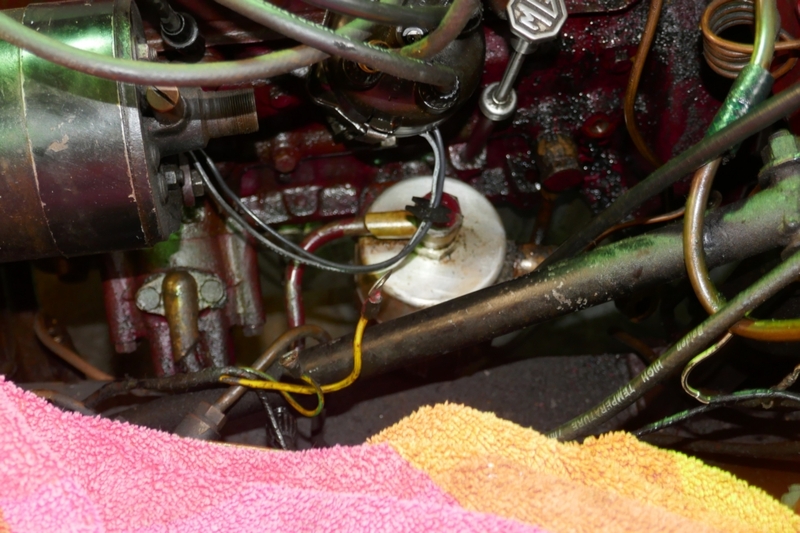 Then took the engine stabilizer off and the front engine mounting bolts. Exhaust downpipe was next. 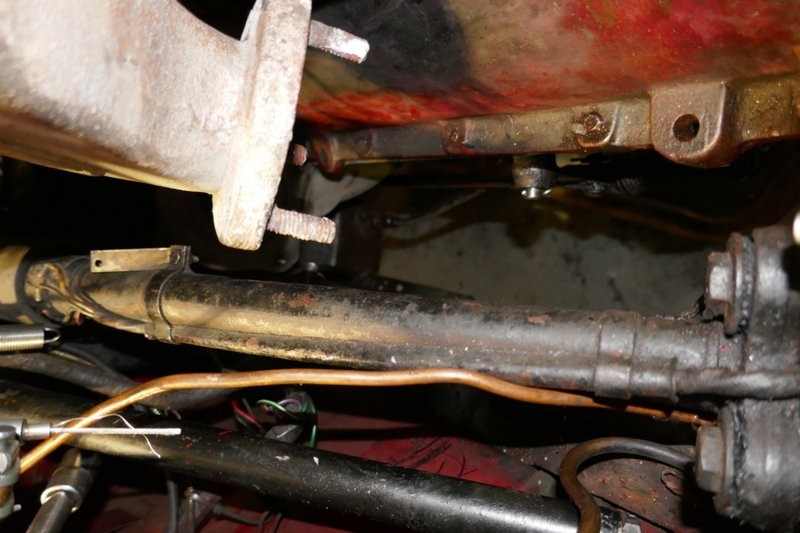 Starter motor cable and engine water temperature capillary tube. Then underneath, after raising the front a bit more, took the centre exhaust bracket off which allowed the exhaust to drop to the floor. Next was the clutch linkage which took ages getting a split pin that had been twisted round off. It reminded me of the first lesson I was taught by my mentor at University Motors, Jimmy White in 1961 - how to fit a split pin. You cut the tail to the correct length. abou 3/4", then bend one of the tails over leaving the other straight. This method enables the pin to be removed easily as the bent pin can be straightened against the straight side and the pin removed. The lower bell housing bolts came out without fuss, my new ratchet combo spanners came in handy for this. 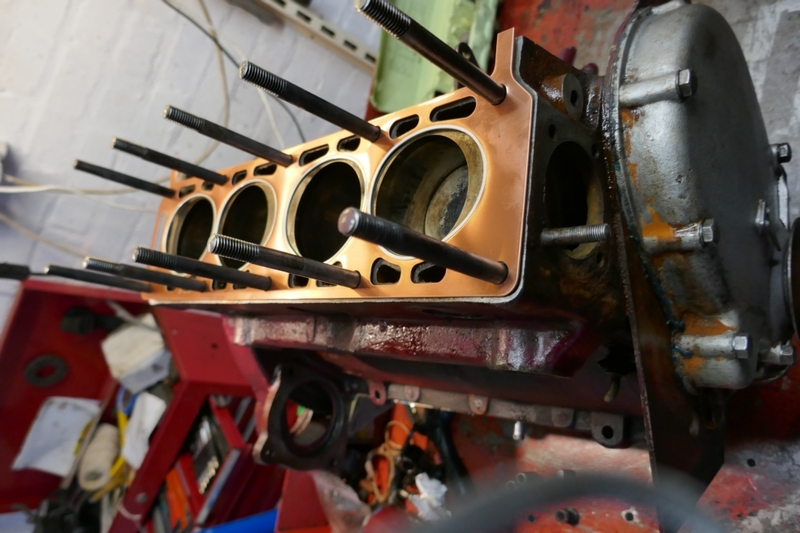 I then got all the tools out and prepared to remove the top bell housing bolts.... only problem is that unlike the TC you cannot get to them from the top. This means the centre tunnel inside the car has to come out and as it was now 1700 I decided that was it for tonight, I'll get the tunnel and top bell housing bolts out in the morning. Engine should be out by mid morning. Engne nearly ready to come out. The right hand side. 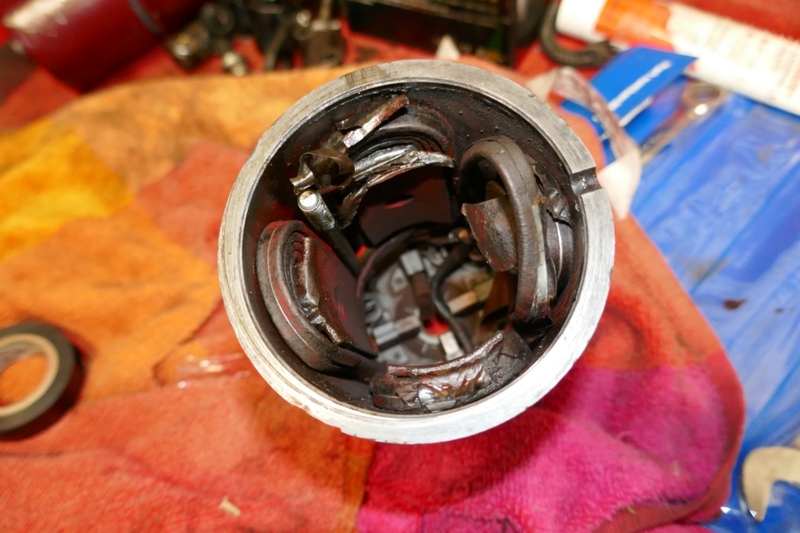 The starter had to come off as it won't go past the steering coloumn. 3rd April 2019 I'm sorry there were no pictures yesterday, I took some but with no glasses (have to wait another week to get new glasses after hospital treatment) I took videos and couldn't read the buttons to turn it off. All sorted now so some pictures have been added. The interior. The tunnel has to come out to get to the top bell housing bolts. .... and laying on the floor. Pistons are not fully sealed with a carbon ring yet. 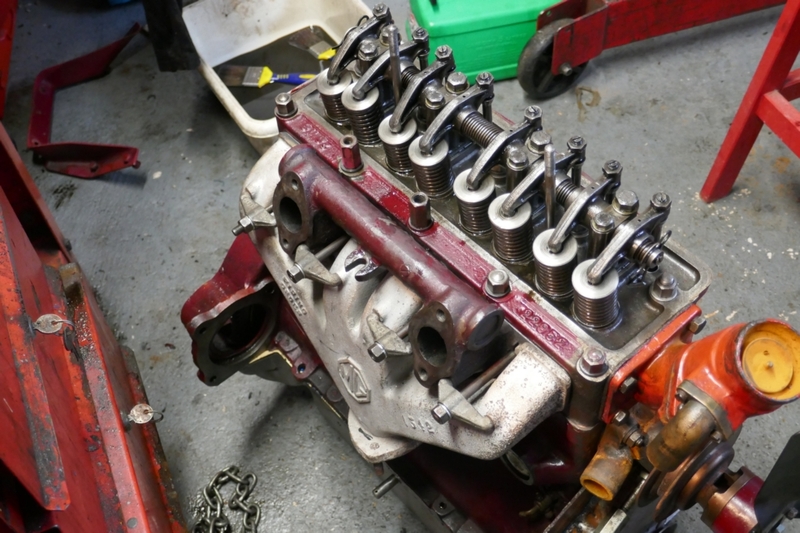 Engine is now on the bench with the sump off. 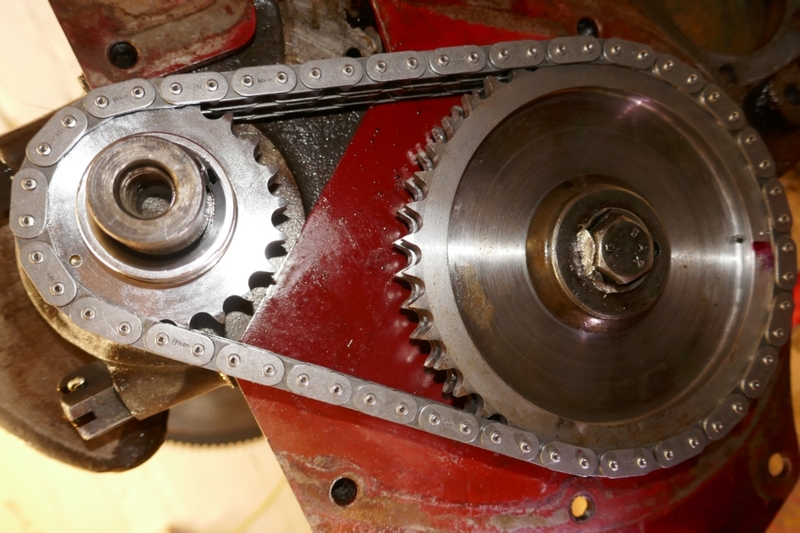 The timing chain which is very slack. Took me over half an hour to get through, the line was engaged all that time. Syd answered (this is the MG Octagon Car Club) and we went through the list. 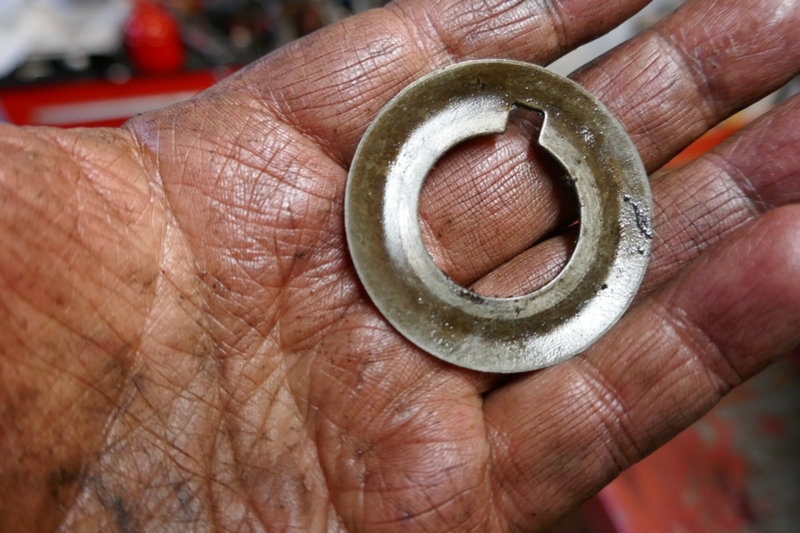 He needed to know what size thread was on the oil filter so I said I'd ring him back. 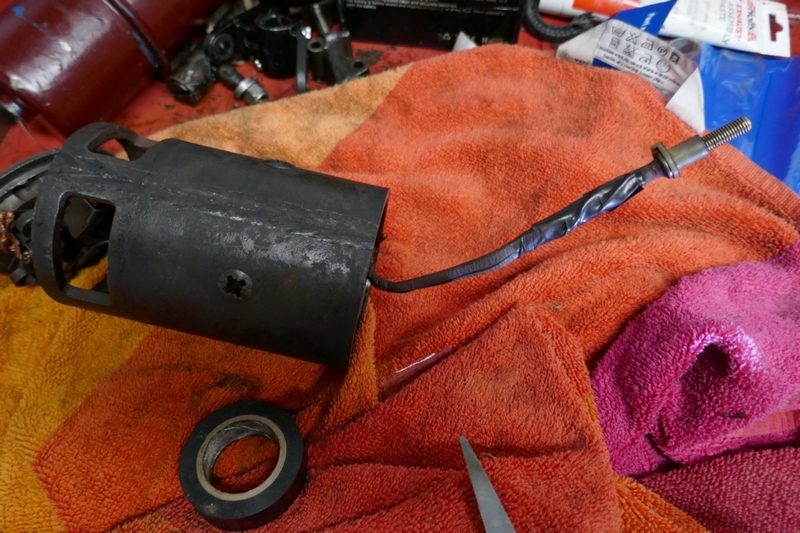 I removed the oil filter from it's housing and read 3/4". Then took over an hour to get back to Syd. He said it had gone balistic, no sonner did he finish one call when the phone was ringing again. 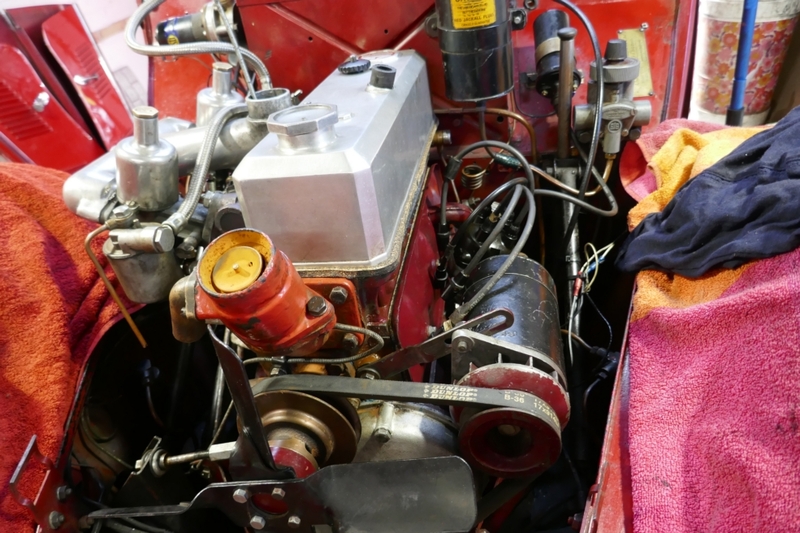 I had the afternoon off as there was little for me to do other than clean all the engine parts and as I didn't expect the parts until Monday I had all day tomorrow to do the cleaning. 5th April 2019 Up with the lark (well a late rising lark). At about 0500 I awoke with a start and remembered I had to take the radiator to a repairer in Leeds. I sent a message to Jerry that I had ordered the parts and he replied asking what had happened about the rad! I started cleaning. First job was to clean the wash bowl. I then got two old 5 litre cans to pour the dirty petrol used for cleaning into. I then proceeded to knock the can over so had dirty petrol all over the bench and running onto the floor. 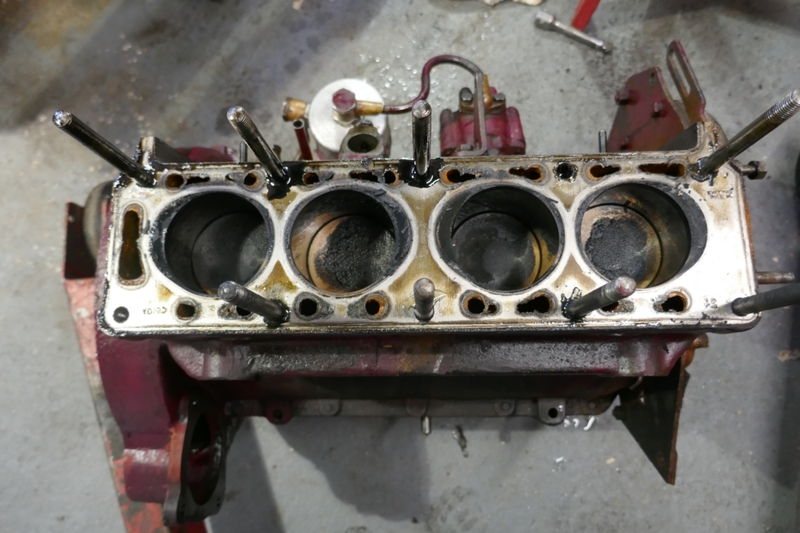 Once that was cleaned up I poured more clean petrol into the bowl and started cleaning and scrapping the old gaskets off with a scraper. That took me up to lunchtime and I came in to find the parts from MGOCC had arrived. That was quick. 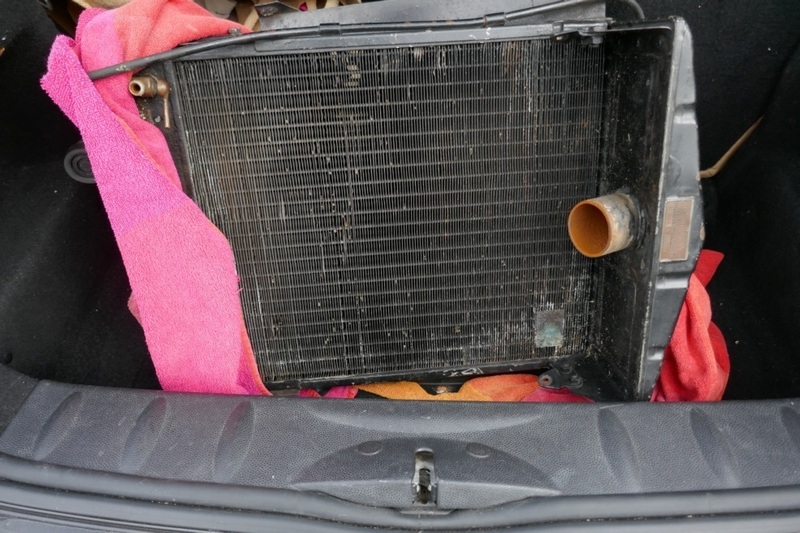 I then took the radiator off the casing, put it in the boot of the Mini, wrapped in an old towel and set off for Leeds. My sat-nav found the Northern Radiator Company without a problem and I was amused at their sighn: "THE COOLEST PLACE TO TAKE A LEAK"
Took a few minutes to leave my details and make my way home arriving at 1400 just in time to watch Countdown. Awoke just as it was finishing and went into the workshop to change the timing gears and chain. I opened the packages to find the camshaft sprocket hasn't been marked. It should have a "T" on one of the links. 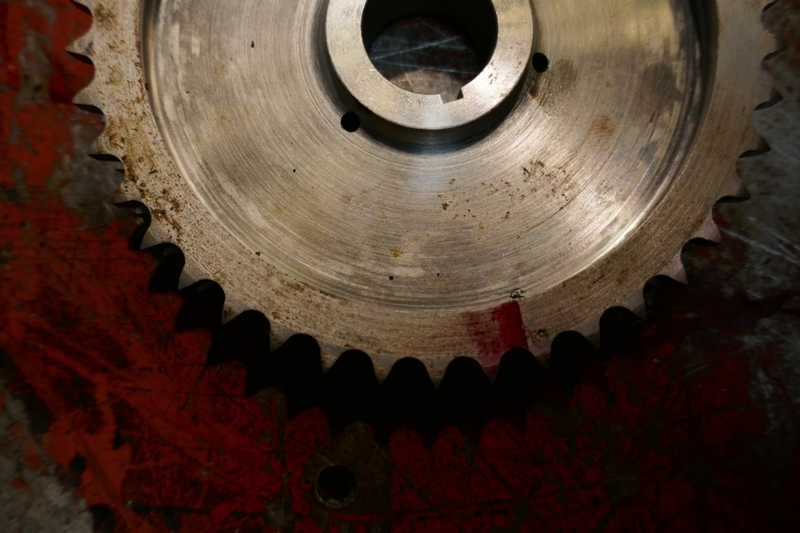 The crankshaft sprocket had a small hole instead of a "T". Never mind I'll have to mark the cam sprocket but need Lynne to see it as my eyesight is now so poor I can't see small, close up objects. At this point I went inside and we watchrd a recording of Countdown. The sump after cleaning. 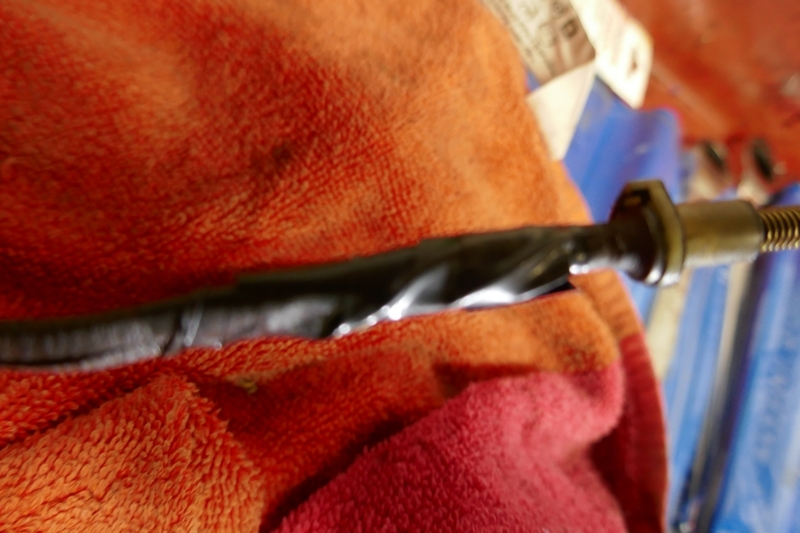 It had a small area of sludge which was surprising as I didn't think it had done many miles since new oil was put in. The face of the block. 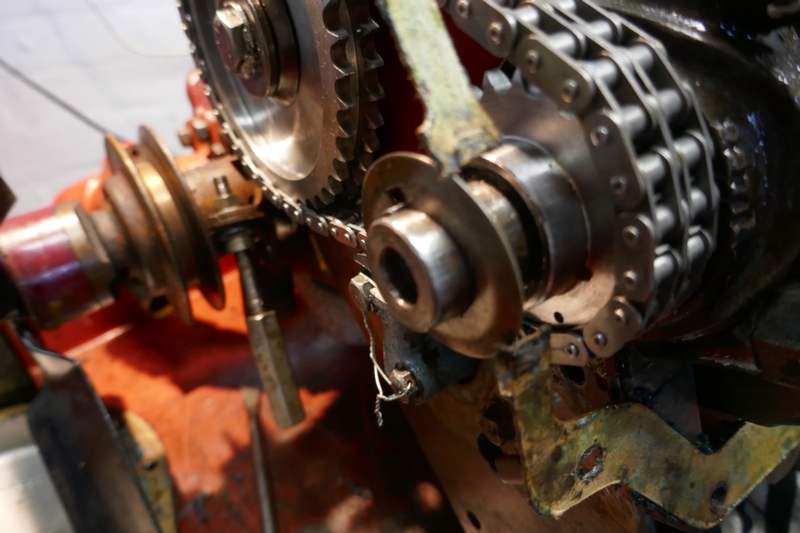 You'll notice the main bearing nuts have split pins and the big ends have nyloc nuts. Originally thse were all castellated nuts and wired together. The head (note the sump cork at the bottom left). 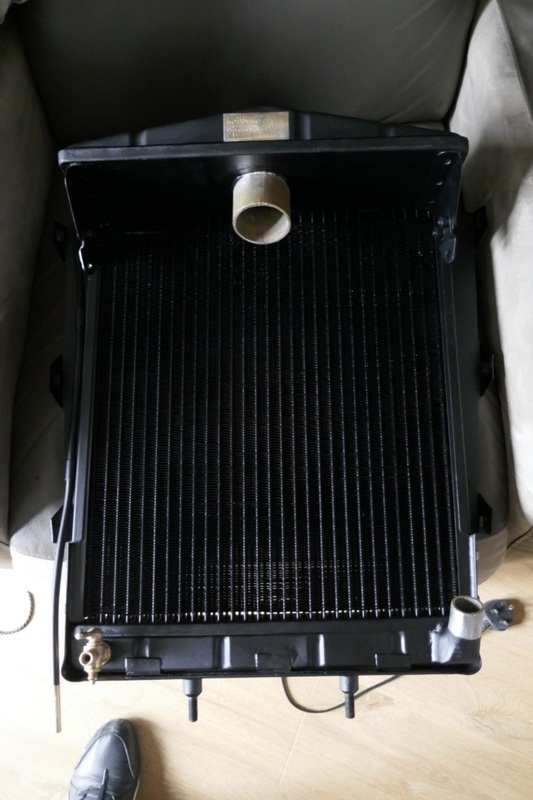 The radiator in the boot of the Mini. 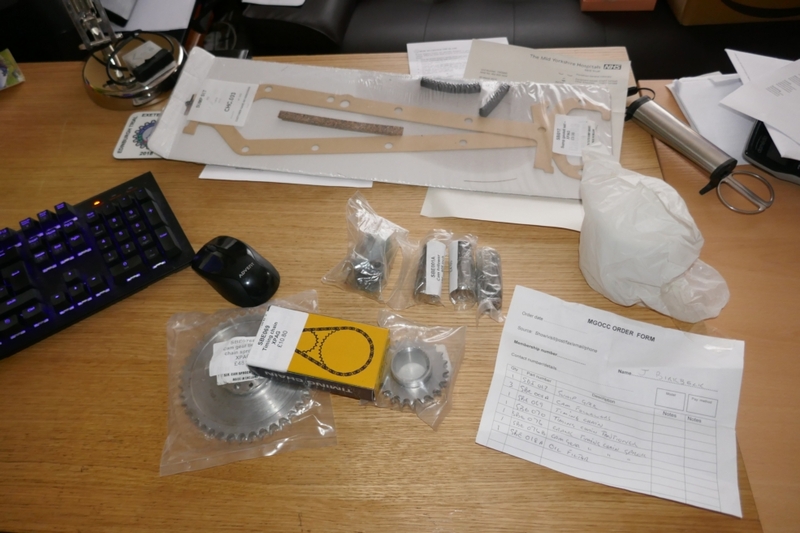 The parts laid out on the desk. 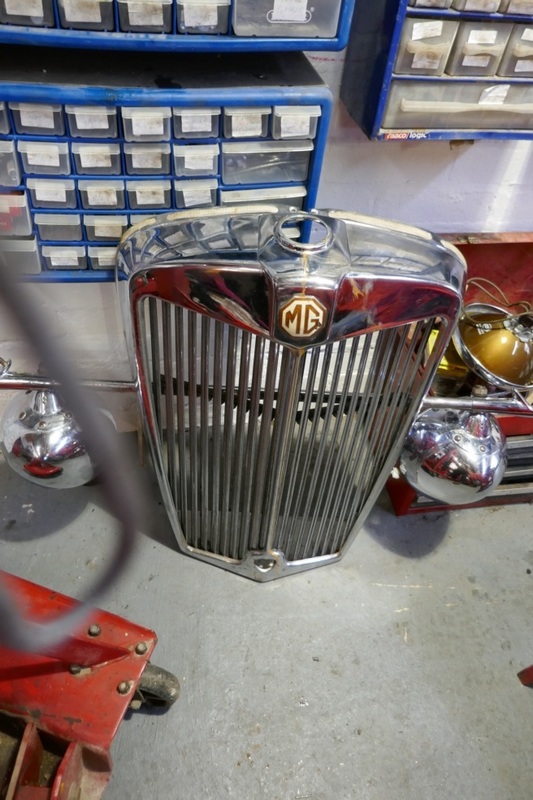 7th April 2019 We did the first classic acr run of the season, the Chesterfield MG Group's Shakedown Run. A group from the South Yortkshire MGOC kept together and stopped at Wirksworth for tea/coffee. Keith was concerned about his clutch he explained it was slipping on the steep hill in the car park and also smelt. I kept asking him if his smelly cruth was any better. We decided to go from the tea rooms straight to the end of the run at Carswell Water, about 8 miles direct, insted of the 60 miles by the Shakedown route. We had a nice lunch and, as everyone else was arriving we set off home. Only problem was i took a wrong turn somewhere and an hour later, (yes a whole hour) we went past Carswell Water again! The car performed faultlessly. 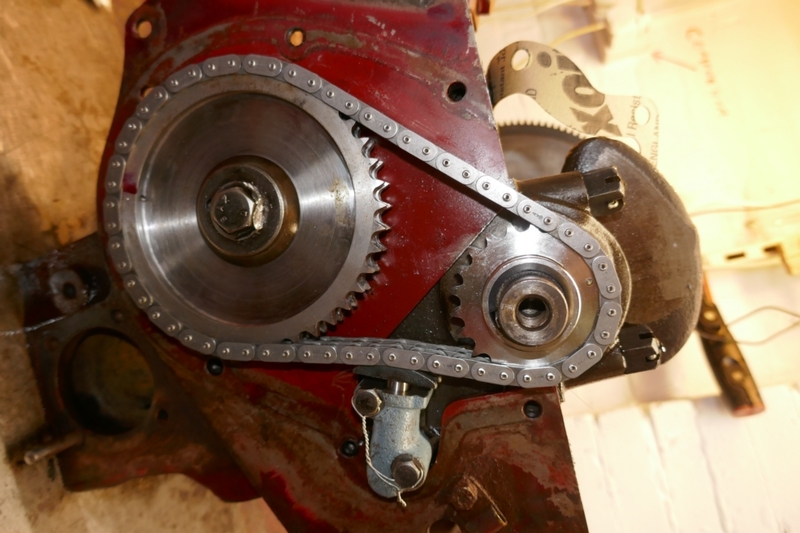 8th April 2019 I carefully marked the camshaft pulley and fitted the pulleys and chain. Then fitted the tensioner and looked for my locking wire but couldn't find it. For some reason a decide to Hyloar the timiing case and "stick" the gasket to it and at this point found the gasket Jerry had was wrong. So that was that for the day. I ordered a new gasket from NTG (couldn't get an answer from the Octagon Club) and locking wire from Amazon. 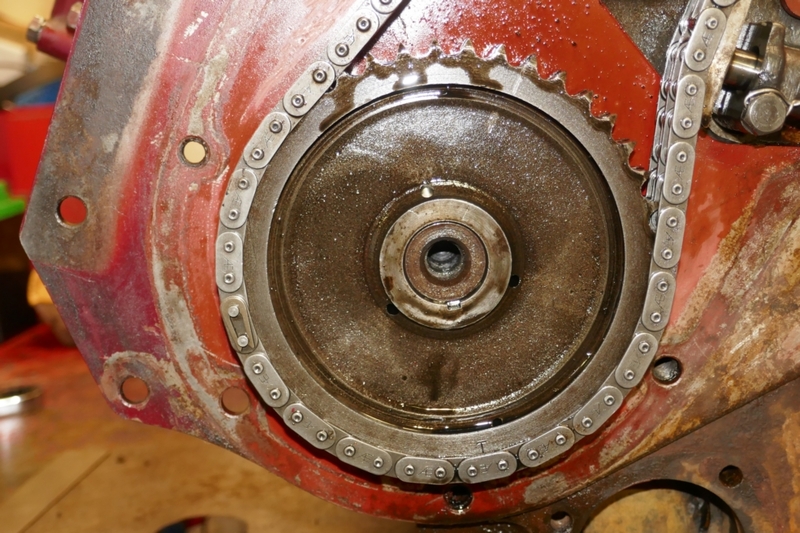 The dot punched on the camshaft sprocket. I had to do another nearer the centre as the chain covered this one. All on and the locktab locked. It hadn't been locked before. 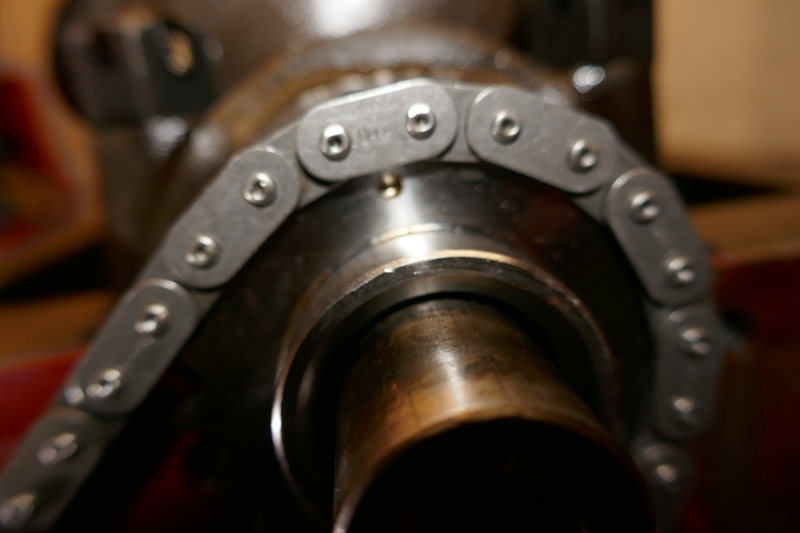 This is the crankshaft dot as supplied. 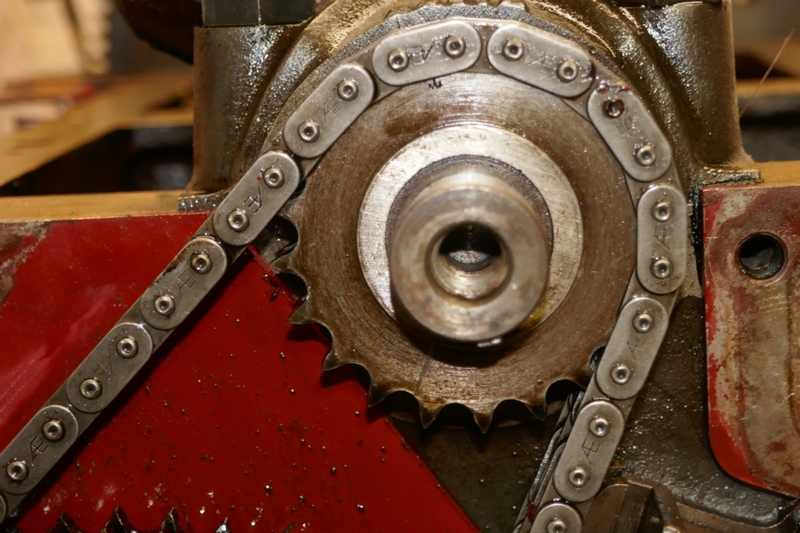 Both sprockets and chain fitted. 9th April 2019 As I couldn't do any work on the engine until the wire and gasket arrived Lynne decided we'd go to Meadowhall so she could get some cometics, have a meal and go to the football match. The wire arrived at about 1200 but the gaskets hadn't arrived when we left at 1430. Wednesday won 3-0, that was good. The gaskets were left, as instructed, in the blue bin. 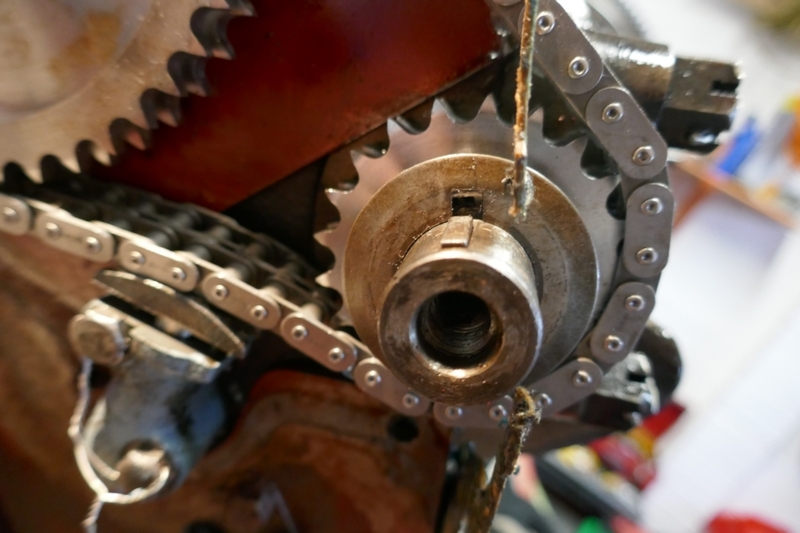 10th April 2019 Up at 0800, quick breakfast and by 0900 the two chain tensioner bolts were wired on. I then wanted to put the timing chain cover on but couldn't find it. I searched for nearly an hour before finding it in the boot of the car where I had left it on Tuesday. I keep telling people I'm a plonker, what more proof do you need. 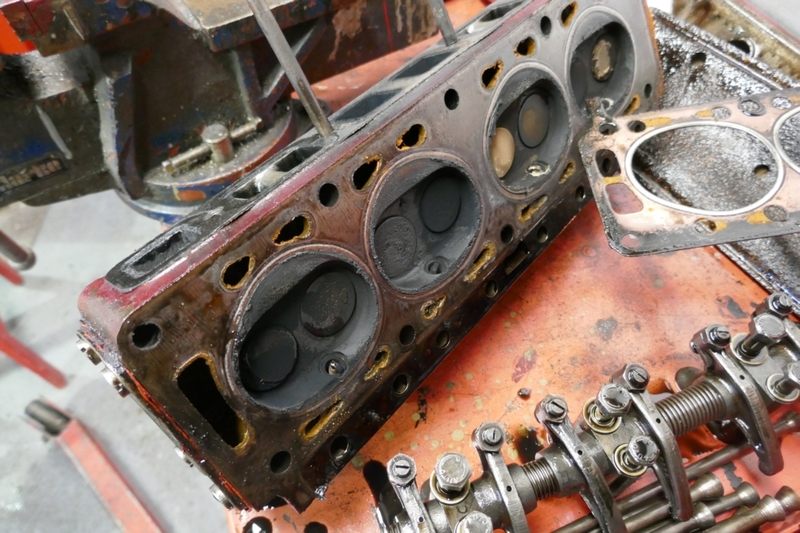 All gaskets smeared with Hylomar the timing cover and sump were fitted. 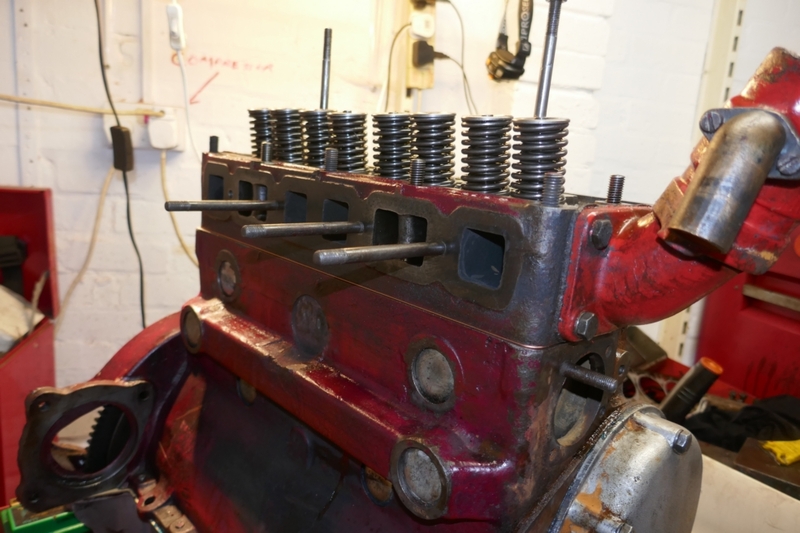 Engine turned the right way up and the block surface to head cleand and the studs refitted. 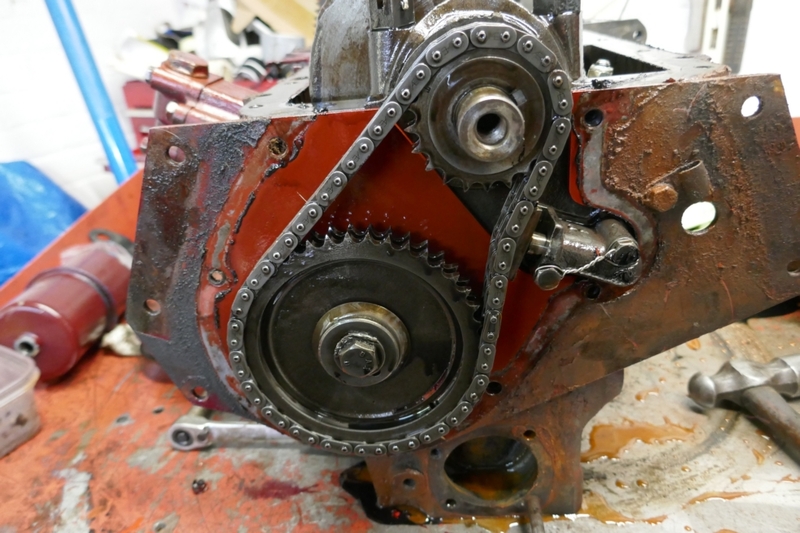 Gasket and head on, then the crank pully fitted. By this time it was lunchtime and Lynne, back from the hairdresser made some lunch. 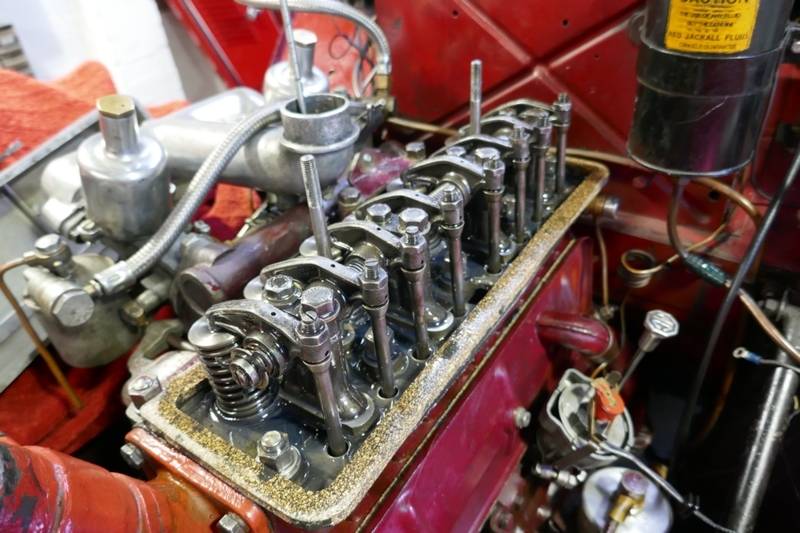 I was beginning to feel tired but pressed on and fitted the water pump and two manifolds. At this point I was looking for a spanner and found..... well see below. The tensioner. now with wired screws. 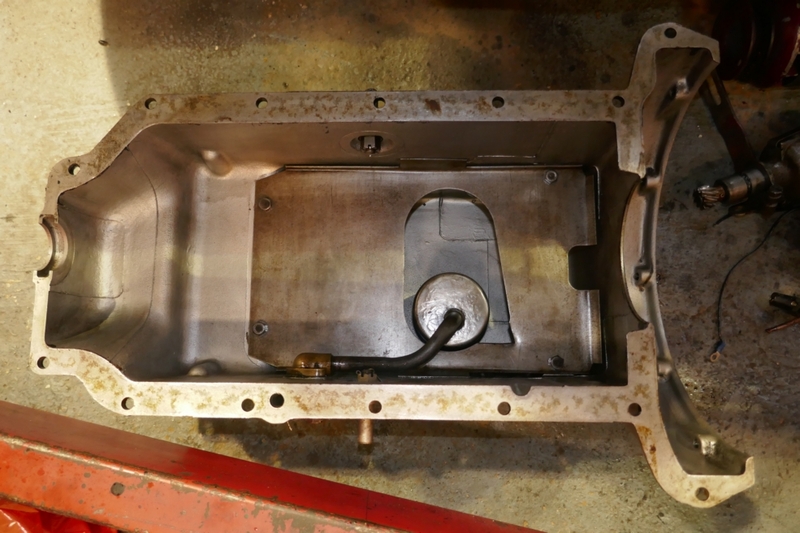 Sump, timing cover and pully on. 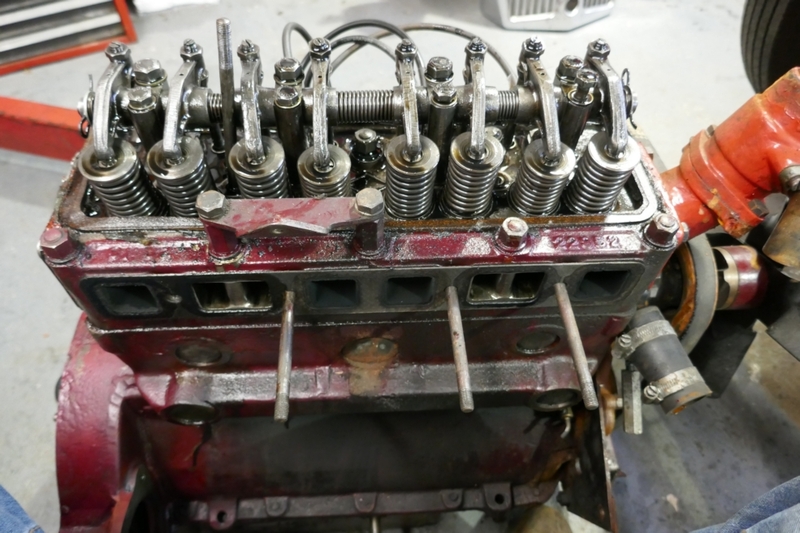 Head studs refitted and gasket on. Head on but not bolted down and cam followers back in, including three new ones. 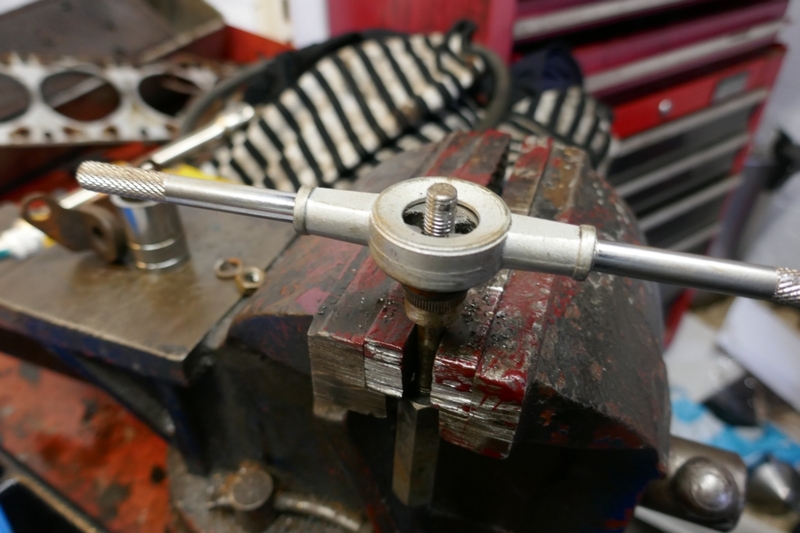 Running a die down the engine steady bar thread. 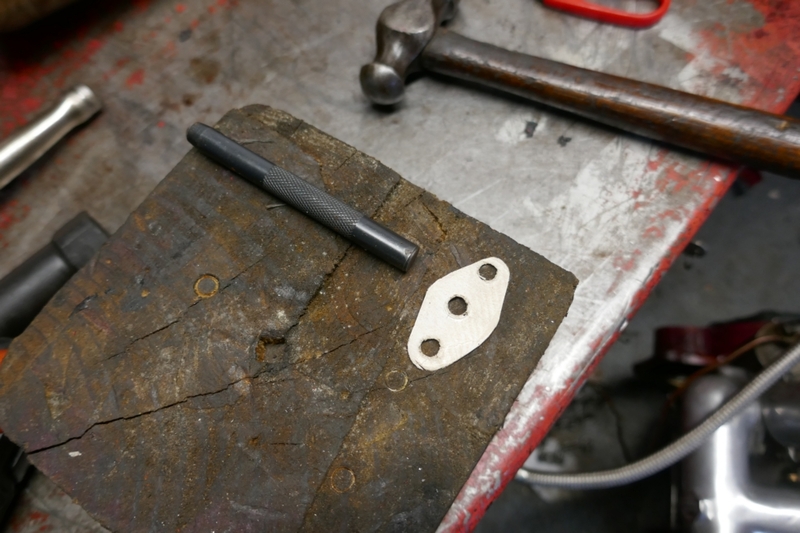 It was loose and the movemnet of the thread through the bracket had flattened the threads. Water pump and manifolds on. OK, total proof I'm a plonker, it's the oil thrower which I forget to put on. 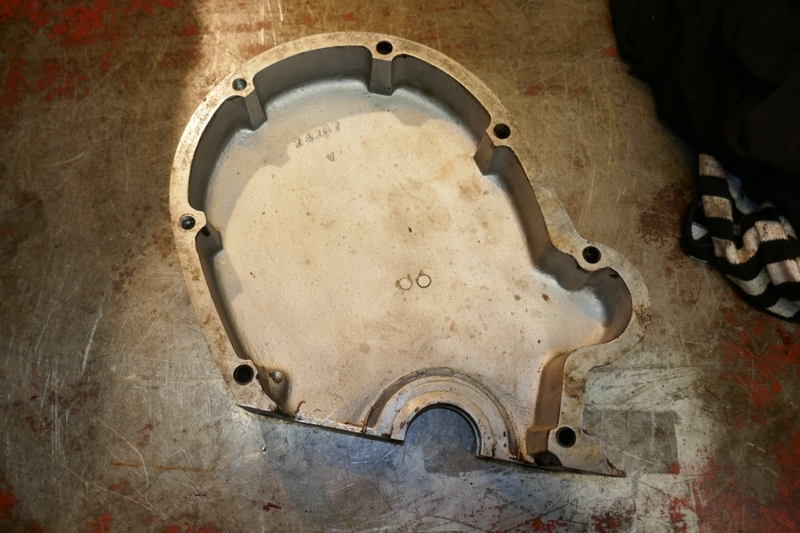 Means the sump and timing cover will have to come off to fit it. It keeps oil away from the front pulley rope seal. At this point, when I'd stopped crying, I gave up and sat down to watch Countdown. 11th April 2019 After physio we picked up our grandson, Malakia and took him out for the day. A couple of rounds of crazy golf, a film, Dumbo (I slept through most of it) then we ended up at our local pub for the quiz. 12th April 2019 I had a 0900 appointment at the opticians. Long story short, she can't get my vision any better, advises I shouldn't drive and to see the consultant at the hospital. After that I didn't feel like working on the car so had a sleep and watched TV all afternoon. 13th April 2019. 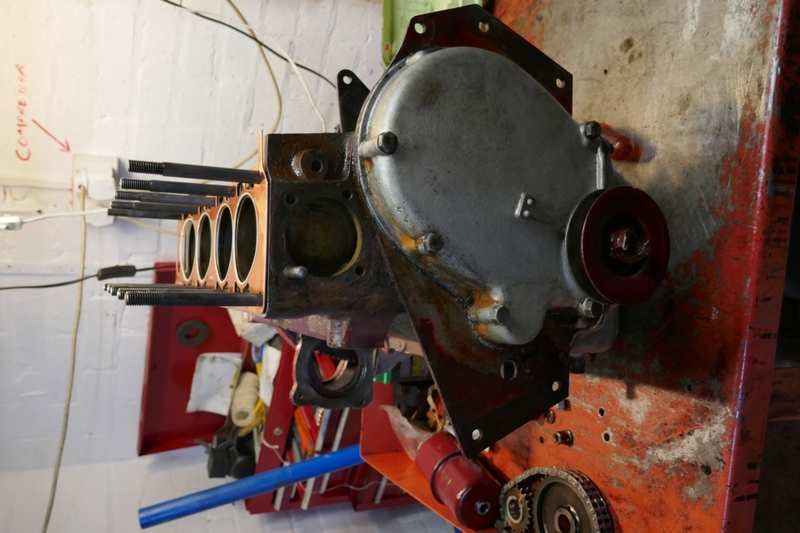 Started at 0830 and got the sump and timing cover off, the oil thrower in and it all back together including the manifold and a few other bits by 1445 when I packed up and watched Final Score. Oil thrower in position and ready to throw. 14th April 2019. Another 0830 start and got the carbs and filter on. 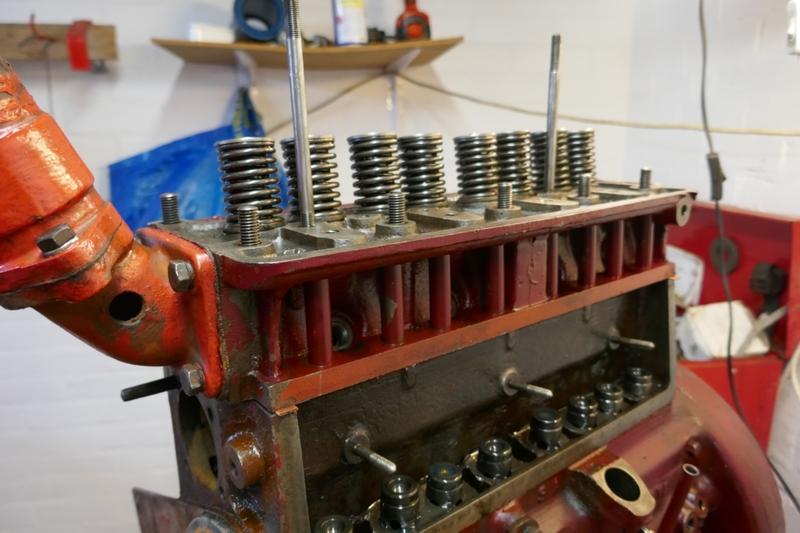 Took the engine off the bench onto the floor and torqued the head down, refitted the pushrods and valve gear and fitted the side chest cover. 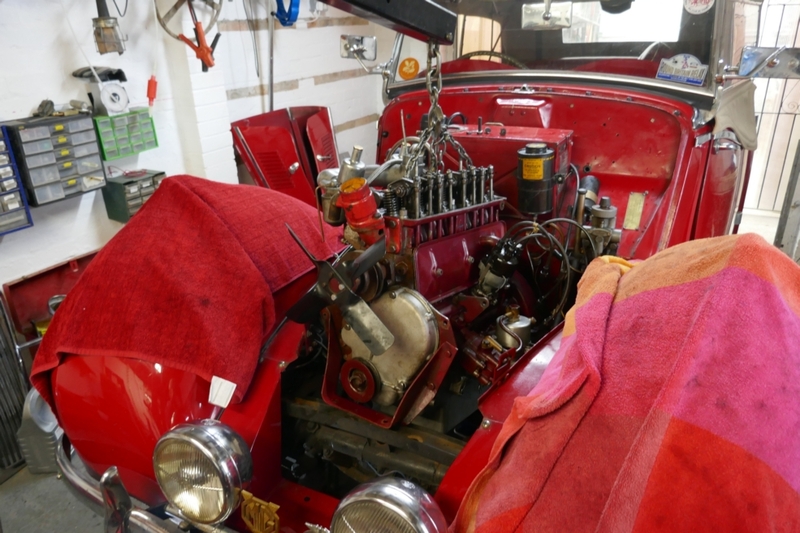 Got the engine ready to put back but have to fiddle the starter back in with the engine half in (otherwise it means taking the steering column off). 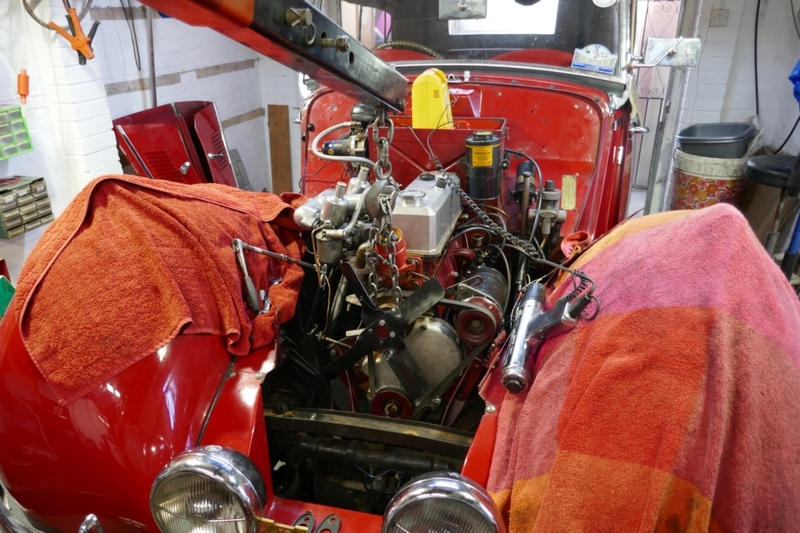 I struggled to do this on my own and ended up taking the engine out again, and tying the starter motor the the narrow shelf. My son-in-law Paul turned up at 1600 and he worked the crane whilst I got the engine in. By this time I was knackered and freezing so packed up. I've been informed we're going out tomorrow so I'll finish it off on Tuesday. 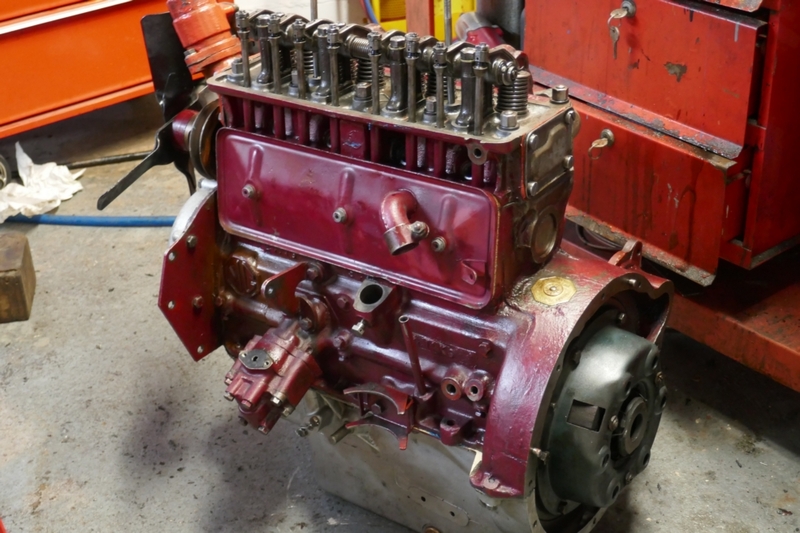 Engine back on the floor and manifold, head and valve gear back on. .... and from the top. And in. I'll bolt it all up and fit all the cables and wires etc on Tuesday. 15th April 2019 Got dragged around Meadowhall shopping! Lynne went to get her face cream from Boots, ordered last week, but it wasn't in so they're sending it to her. Whilst she was doing that I bought some CD's - Fleetwood Mac, Miles Davis and Duke Ellington. 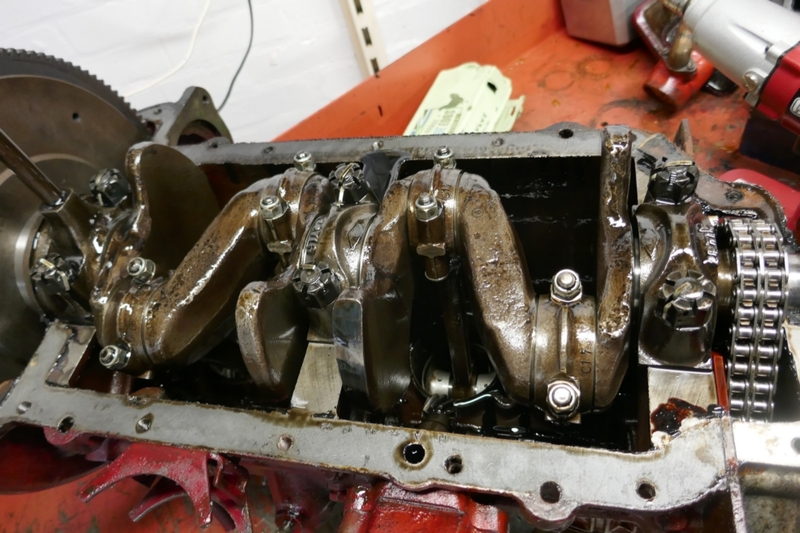 16th April 2019 Started at 0830 and got a surprise as I thought the engine was fully in when we left it on Sunday.... wrong, I struggled for 3 hours to get the engine fully home then went underneath to see if it was lined up, it looked like it was from above, and found the gearbox had turned ninety degrees. No wonder it wouldn't go in! Straightened it and asked Lynne to operated the crane and got it in eventually. I was knackered. The other problem I have is that my artheritic fingers keep dropping things and then it takes ages for me to get on the floor to retrieve them. 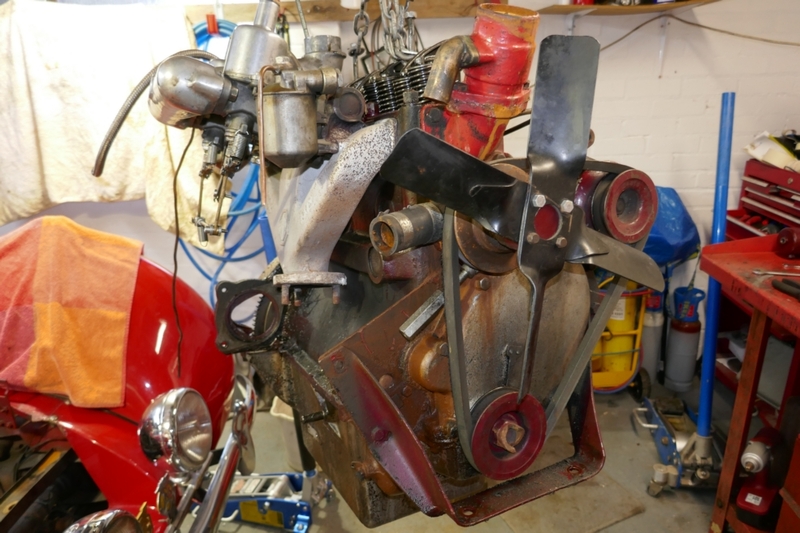 Anyway the engine's fully bolted in, starter is in, clutch cable is on and carb controls are connected as is the capillary tube for the temperature gauge. The oil pipes are on. It's taking time as I'm trying to fit correct BSF bolts and setscrews where incorrect items have been fitted. I packed in at 1600 and will finish it on Friday. We're off to Chester Zoo with Son, grandchild and son's new girlfriend and her two kids tomorrow and at hospital on Thursday. 17th April 2019 The zoo was really good, the journey wasn't. It took over an hour to get from the centre of Glossop to the lights at the top of the hill at Mottram. We got there at 1200 and left at 1730 had a meal at a local pub then made our way home. 18th April 2019 We went to Northern General Hospital with Lynne. She had a 1030 appointment for breathing tests and an 1100 appointment with the consultant. Malakia (grandson) and I sat in the car expecting her out for 1115.... she turns up at 1230! They were running late but the tests took over an hour so she wouldn't have made the consultants appointment for 1100 anyway. From the hospital we went to Meadowhall and had lunch and bought grandson some new shoes. Got home at about 1600, too late to do any work on the car. 19th April 2019. 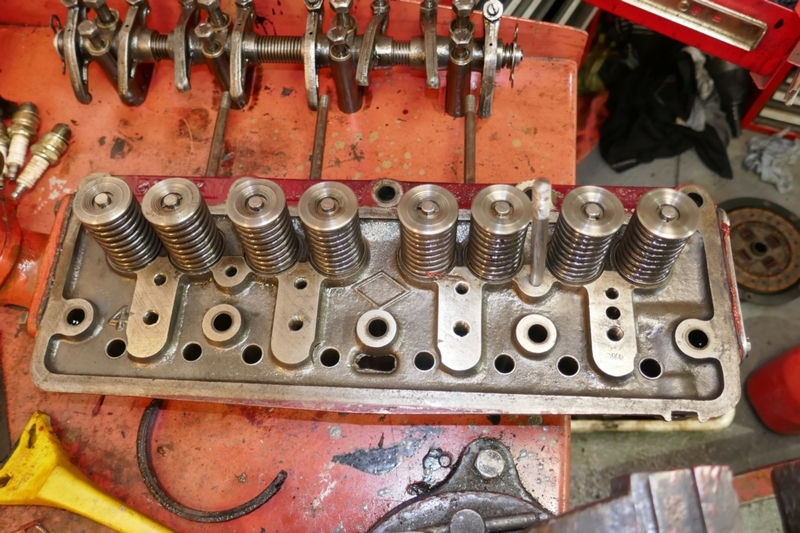 Started at about 0830 and first job was to set the tappets. 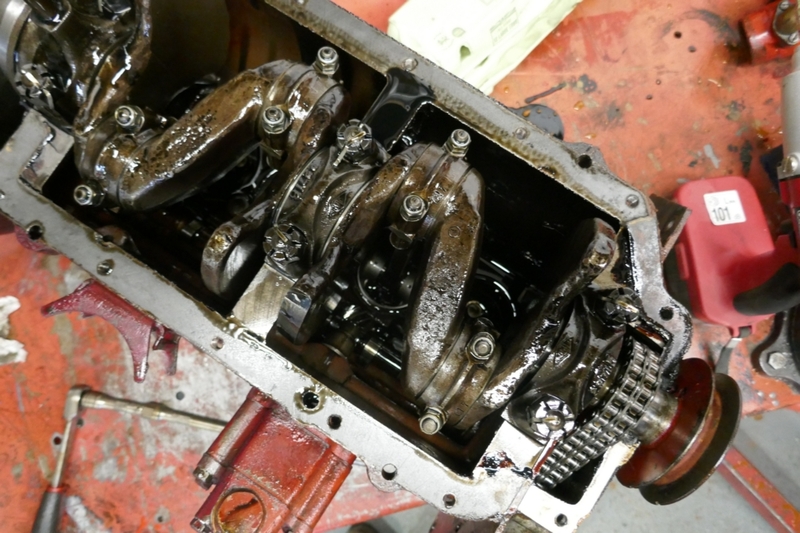 I then stuck the rocker cover gasket to the head with some black gooey stuff and refitted the rocker cover. The oil went in next. 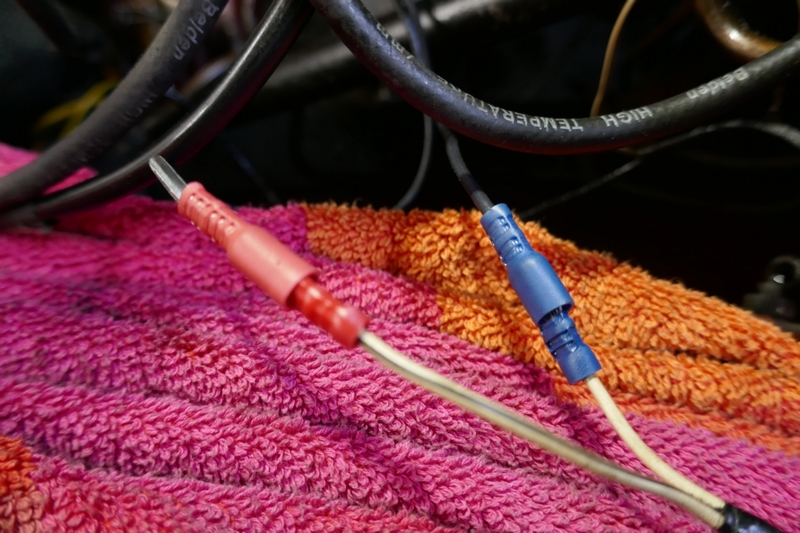 I then spent some time changing the wiring connectors on the distributor wiring to a bullet connector on one wire and a spade connector to the other. 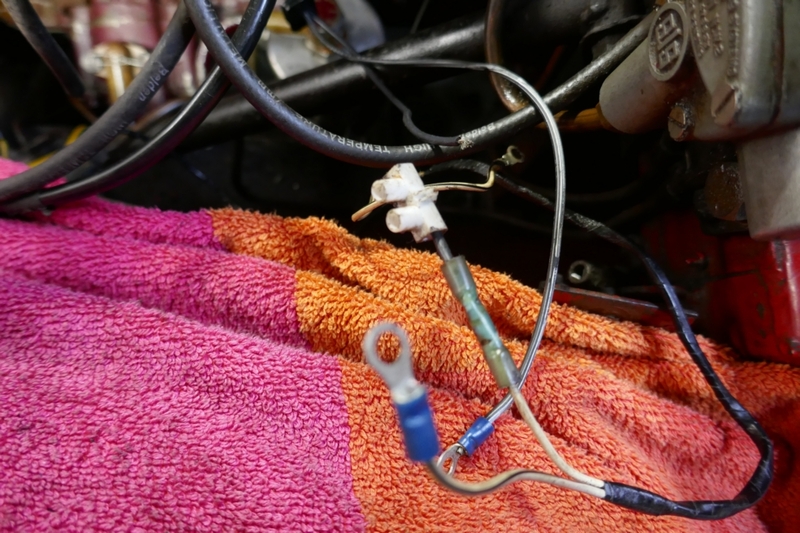 I know the cars didn't have these connectors when new but the car has Accuspark electronic ignition hence the connectors. The wiring was connected with a terminal block on one wire and a small screw and nut through two ring connectors for the other. Then, when refitting the breather pipe the distributor cap clip fell off. With my eyesight I had no chence of getting the pin back in with the distributor in so out it came and the clip was refitted. I held the two clips together with an elastic band. Distrubutor back in and as I was fitting the cap the clip fell off again! Distributor off again and this time I was able to get it back in and the cap on without the clip falling off again. Dynamo was then cleaned and refitted. Now for the underneath. I had to remove the bell housing bolt which holds the earth strap and put the breather pipe bracket on it. I tried for ages to get the bolt back in but it wouldn't go. A very close inspection showed that the thread in the sump had stripped and there wasn't enough good thread to get the bolt started. I maust have struggled for a good half hour with this mainly because I couldn't see that the bolt was all the way in before trying to start it. I made a new longer bolt and got the earth strap and breather bracket tightened up. Then to refit the gerbox mounting rubber that had fallen out whilst I had struggled to get the engine in. Jacked box up and placed rubber in position without too much drama. I noticed the bolt that holds the gearbox to the chassis does not have a nut on it, a job for next week. This explains why the gearbox turned ninety degrees when I was refitting the engine. OK, last job for the day, after lunch and a sit down is to refit the exhaust. 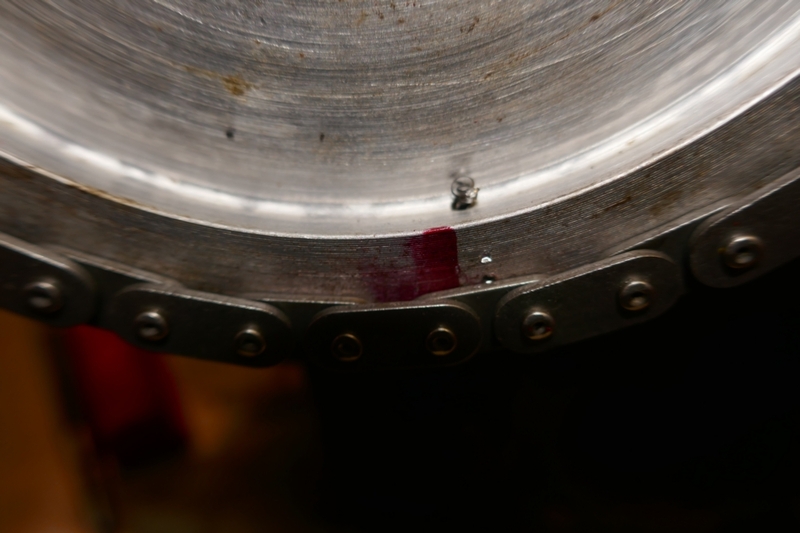 Put a smear of Firegum on both side of the flange joint which promptly falls apart! I'll have to order one on Tuesday. 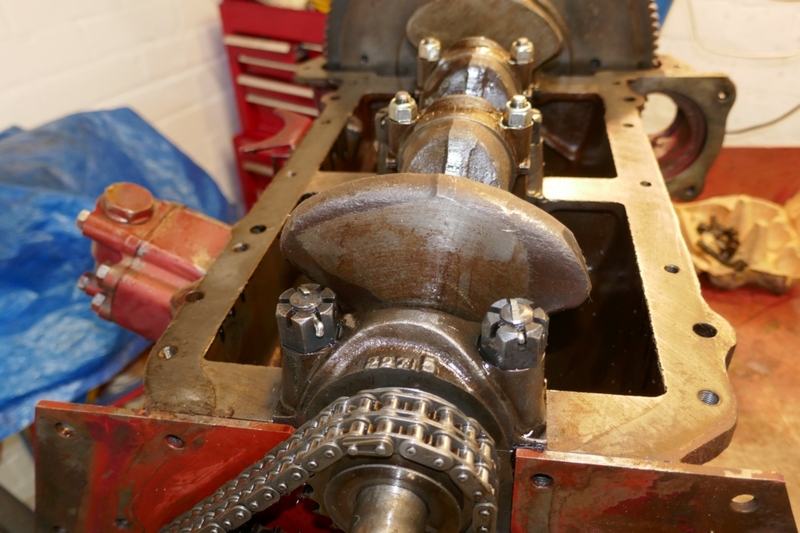 I'm planning to refit the tunnel and fit a nut to the rear gearbox mounting on Sunday. 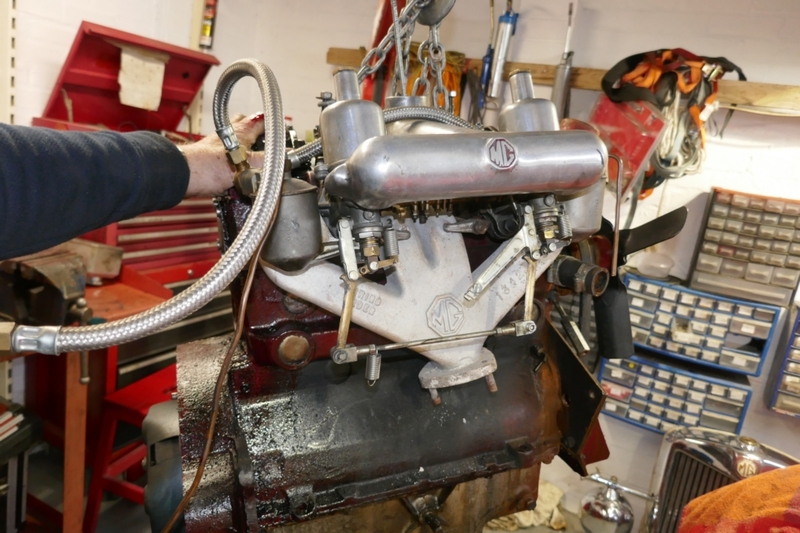 When the exhaust is on I'll set the ignition timing (had to ask the TABC group how to do this with electronic ignition) and start the engine. Hopefully the rad will be back by Wendesday and I can then refit it and finish the job. 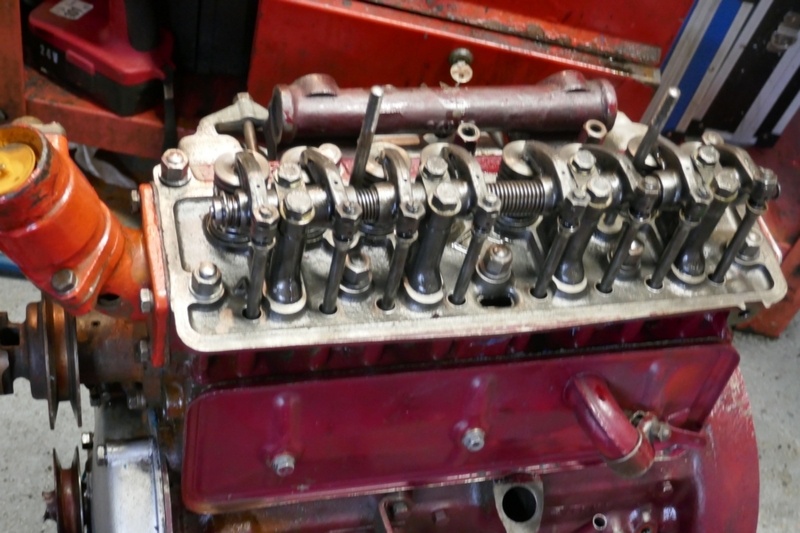 Gasket in place and tappets set. This is after the oil had been pored in. I took the cover off to set the engine to TDC on cylinder 1. .... and this is how thay are now. All done except the plugs need cleaning (in sandblast cabinet) and refitting. Tomorrows plan is for Lynne to take me to Sheffield station for 0730 for me to catch the 0752 train to York, then the Edinburgh train followed by the Cumberlamd train and finally the Coatbridge train. 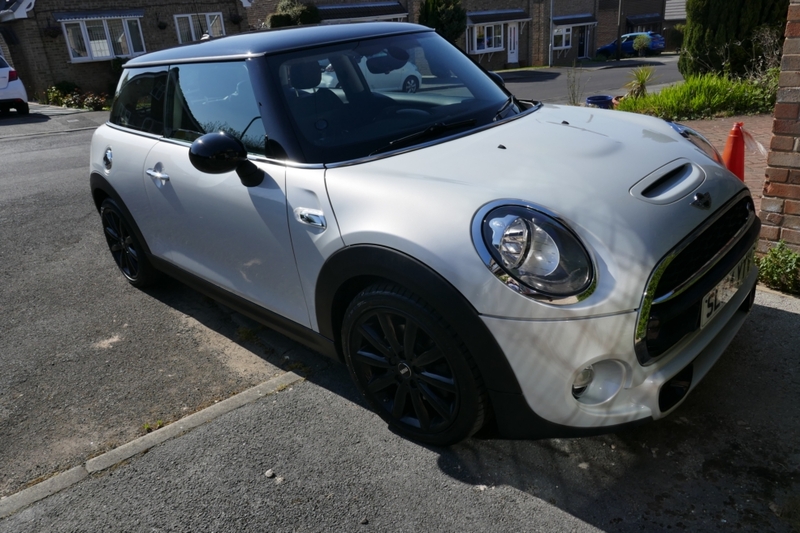 You may be wodering why, it's to collect a new Mini Cooper S I've bought her. Nothing wrong with the one she's got but I have a feeling it's going to give trouble in the not too distant future. The "new" one is four and a half years old and has 23,000 miles. The present car is ten years oldd and has just turned 70,000 miles. 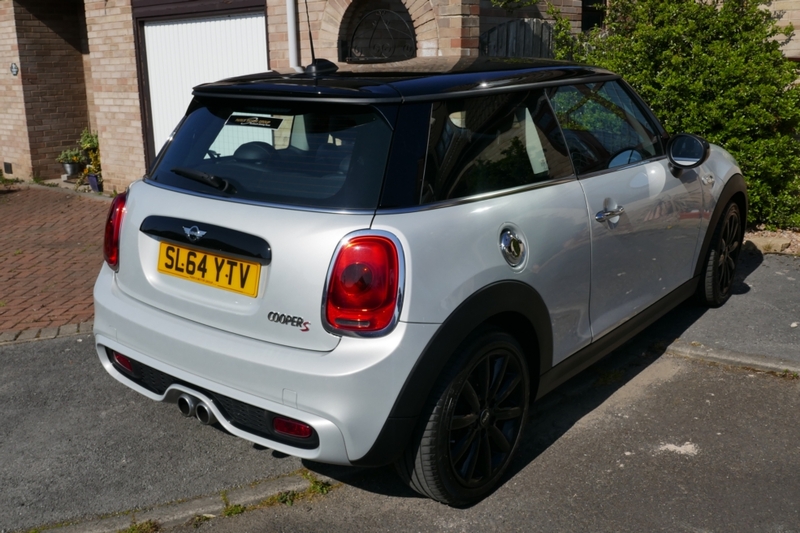 I'd booked the train from Sheffield to Coatbridge (Glasgow) to pick up Lynne's new Mini Cooper S.
She drops me off at Sheffield station at 0730 to catch the 0752 to York at 0843 then the 0900 to Edinburgh. After which a local train to Coatbridge via Cumbernauld. Should get to Coatbridge at 1325. Alight the train at York on platform 10 and look up at the display board right by the side of the carriage. It has one list of two pages. There's the LNER to Edinburgh leaving platform 3 at 0900. Make my way to platform 3, train arrive a 0855 and depart s at 0900. I find a seat and listen to the announcment..... "Welcome to the LNER non-stop service to KINGS CROSS!" When the ticket lady came I explained the board had said paltform 3 for Edinburgh and her response was that I must have looked at the arrivals board. She wrote a note on the ticket to the effect that this idiot got the wrong train and to put him back on the 1100 to Edinburgh. In mitigation of being a right plonker a) why was there an arrivals board on the platform, surely it should only be in the station concourse and b) what's the chances of the Edinburgh to London train arriving at 0900 and the London to Edinburgh train departing at 0900. Had the board said 0859 or 0901 I would have checked more closely or asked. Never mind, a quick google showed the 1100 from London arrived at Waverley at 1527 and the Cumbernauld train departed at 1535. Tight but I should make it. The Cumbernauld to Coatbridge train arrived ar 1635 so just about OK as the dealership closes at 1700. I then phone the dealer and explained I was held up and would be arriving at 1645 but if I was a few minutes late to wait for me. John, the saleman said not to worry he'd be there. When the train left Newcastle they announced they were running 10 minutes late.... I was going to miss that train and the timetable showed I wouldn't get to Coatbridge until 1715. Lets see if the driver makes up some time. I made my way to the front of the train so I could sprint.... er well walk a bit faster than my normal crawl, and try and get that train. Alighted at Waverly at 1531 to be met by total chaos. There has been a signals failure outside Glasgow. About half the trains had been cancelled, including mine, but I established I should get the next train to Cumbernauld from platform 7. I had arrived at platform 6, been directed to the other side of the station to find out which platform and now had to walk back. Got on the train which left at 1610 but it crawled along and kept stopping for minutes at a time. I phoned John to explain and he was OK, said he'd wait. After 3 stations the train speeded up and I decided I'd get a taxi from Cumbernauld to Coatbridge (about 17 miles) so as not to keep John too long. However the Coatbridge train arrived 2 minutes after me so I got on that. The board said it went on to Wifflet which was nearer the dealership than Coatbridge Central so I imformed the ticket collect that as I was now an hour late I would be going on to Wiflett. I had my icy stare that said DON'T ARGUE. He just smiled and said "of course Sir". I arrived at the dealership at 1735, signed all the papers thanked John and made my way home ariving at 2145. The car, by the way, is really good, she should be pleased. 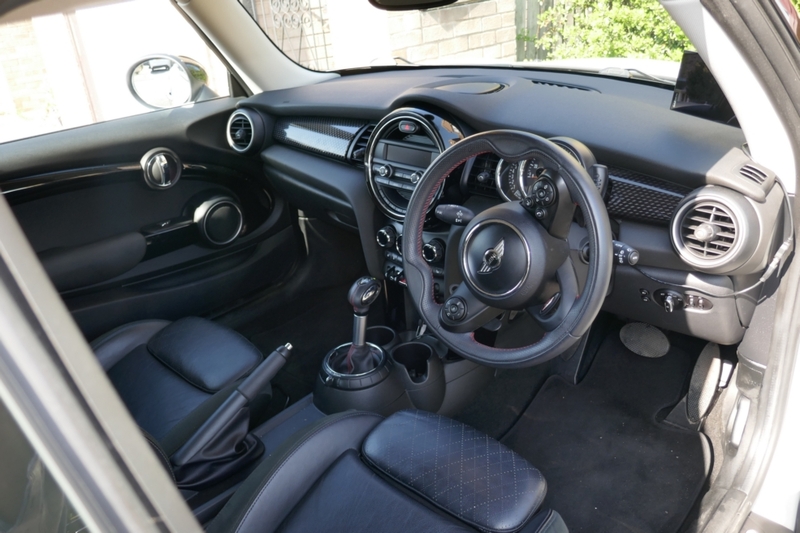 It's a 2014 2.0 litre Cooper S with all the goodies and 23,000 miles. 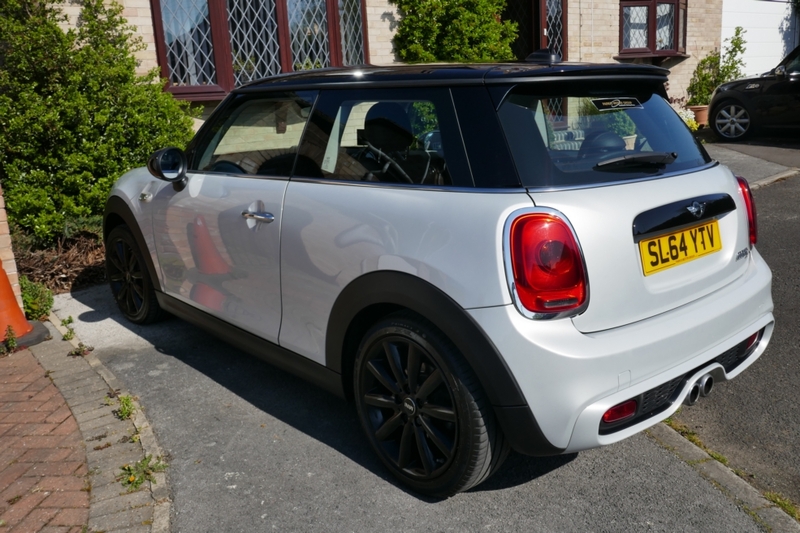 She currently has a 2009 1.6 Cooper S with 70,000 miles which is begining to show it's age. I've now been through everything with the handbook. It's got A/C, heated seats, cruise control, steering wheel controls for the radio which has a USB connector for memory sticks and a bluetooth connection for the phone. It also has an on board computer, full leather seats and they are far better than her existing car. For one they go back a bit further so I can get to the seatbelt. The performance is better and all round the car is much smoother. It was doing less that 3000 rpm at an indicated 100 mph over Shap. The computer says it averaged 37 mpg which isn't bad seeing as I rarely went less than an indicated 80 mph. The colour is best described as silver/white. Better than the black she has now which she doesn't like. 21st April 2019 I was going to do more work on the YA but after yesterday's exertions I took it easy. We spent a few hours learning all the controls of the car and went for a drive so Lynne could get used to it. Later I sat outside in the sun for an hour listening to Joni Mitchel. 22nd April 2019 Up early and went to Matalan so I could get new cotton shirts for this year. I need seventeen for our Ireland holiday! Then to Meadowhall to drop my phone into ismash for a new glass. I smashed the bottom edge some months ago when I tripped in ASDA's car park. Then into M&S for new knickers and socks. Lunch and onto football where we beat Bristol City (above us) 2-0. We're now 9th but with only 2 games left it's highly unlikely we'll get into the playoffs. In a way I'm pleased about that. The owner is selling the club and we need an new owner who can spend some money on players for next season so, if we do get up into the Premiership, we have a chance of staying there. 23rd April 2019. Started at 0900 and got a nut on the rear gearbox mounting. Then refitted the tunnel. 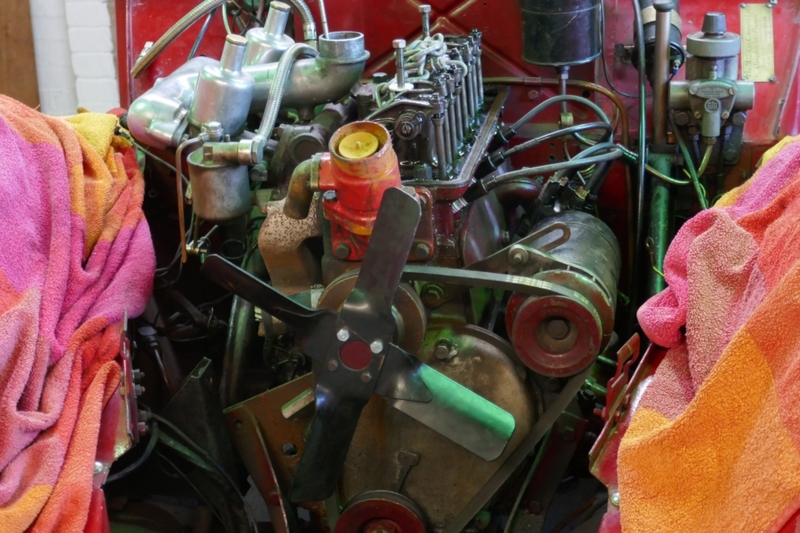 The only job left is to set the ignition timing which I'll do when Lynne gets a minute to help. 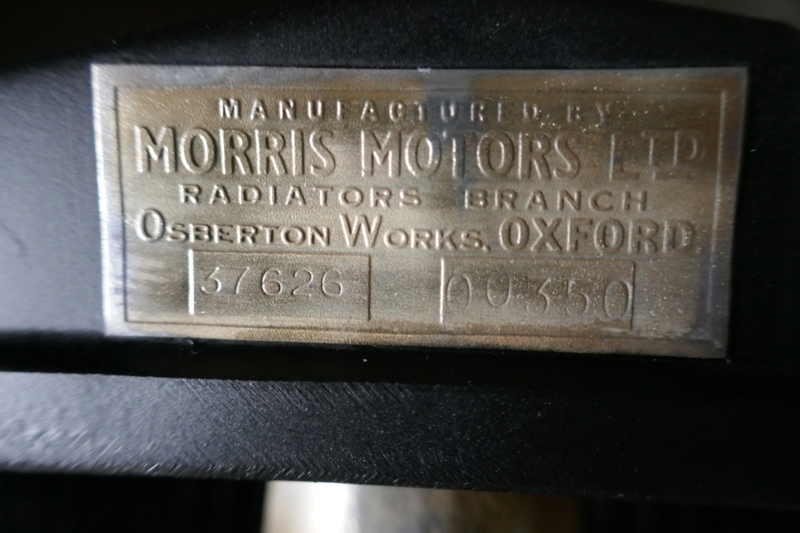 The radiator won't be ready until next Friday pm. 24th April 2019 Took Lynne to Barnsley hospital for an appointment with an endrocologist (?) about her sweats, er, perspiration. He told us all her test came back OK and it's just one of those things that she gets hot (suppose I should be glad I've got a hot women). He could prescribe medication but he said he wouldn't let his wife take it as all medication can have side affects and it wasn't worth the risk. I'd already shhok my head to Lynne so we were both in agreement. However, it was nice to find a doctor who advised against pills. From there we went to Morrisons for the weekly shop. Well Lynne did the shop whilst I sat in the car reading the handbook and finding out more about the car. In the afternoon I seettled down and listened to the new Fleetwood Mac CD with 50 of their best tracks. I bought it when we were at Meadowhall on Monday, I wanted Rumours and Fleetwood Mac but they only had the compilation album "50 years". By the time I'd played all 3 CD's it was 1730. During the afternoon the radiatior company called to say the rad will be ready in the morning. It doesn't look as good in a picture as it does in the flesh. 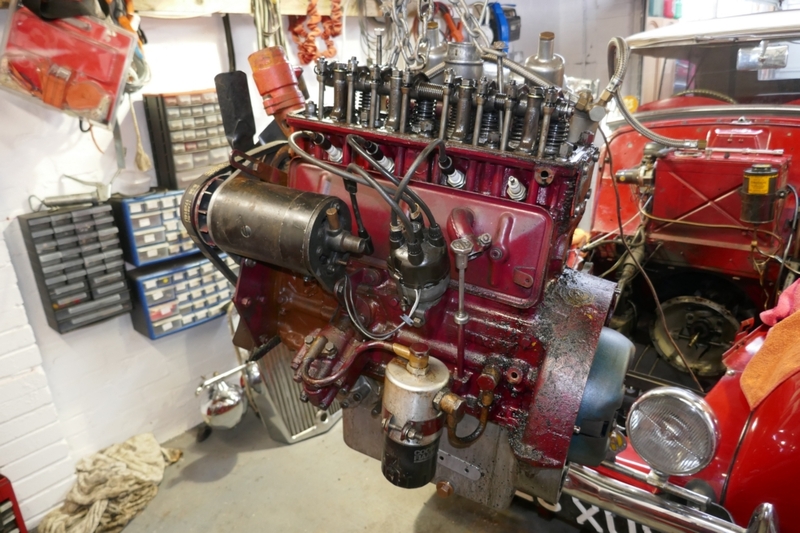 26th April 2019 Up early to sort the starter motor out. All thats left to do is the exhaust to refit, 3 nuts on the downpipe easy to get at from underneath, the front exhaust pipe hanger also easy to get at. Then the radiator and hoses to fit, heavy but nothing difficult. Should be finished by lunchtime. WRONG! I put a meter on the starter terminal and it's going to earth. Remove the nut and wire and test again. The post is going to earth. 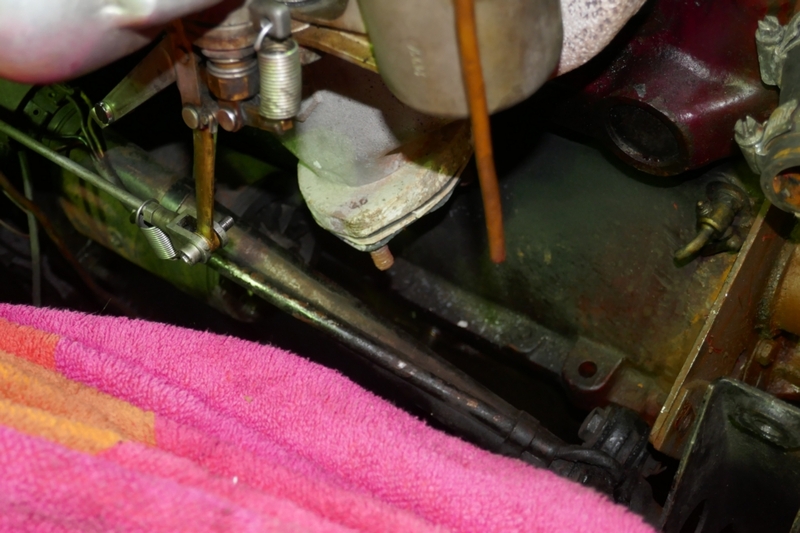 Nothing for it but to remove the starter motor.... this means I have to raise the engine (or remove the steering coloumn-it's easire to raise the engine. So off with the steady bar and the two front engine mounting bolts and using the crane raise the front of the engine as high as it'll go. 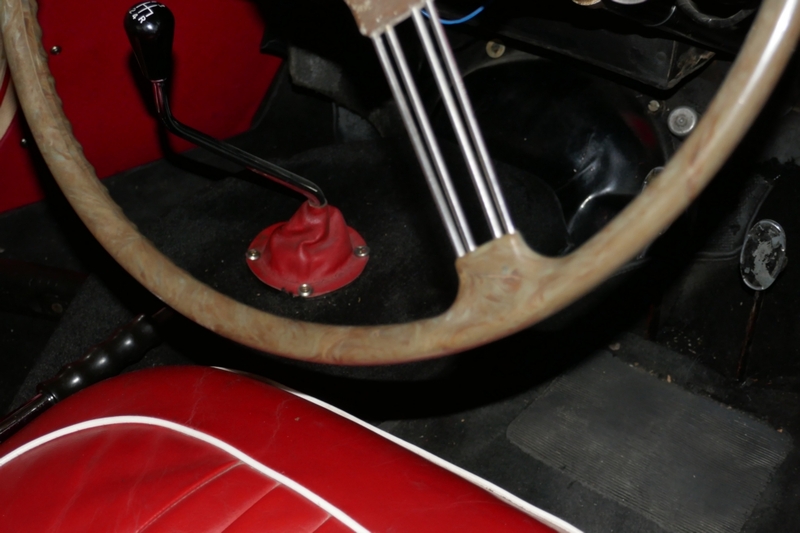 Wiggle the starer and it drops between the engine and chassis. On the bench I remove the two body screws and pull the top plate off. The lower part of the strap that is connected to the threaded post the cable connects to is twisted and bare. I pull the body off the armature and straighten the strap and wrap insulating tape around the bare end. Reassemble (without spending ages getting the brushes back in and test again. Still a dead short to earth. Take the body off again and have a good look inside with a good light. The insulation around the inside of the body has broken up and is flaking off. This is beyond me so I spend half hour ring local auto electricians to see if the can repair it. They all laugh, they can repalce an alternator or fit a radio but repair a 70 year old starer, was I have a laugh! The chap I knew who could have done retired about 10 years ago. So I ring Jerry and give him the good and bad news. Good news is the rads back, bad news he needs an exchange starter motor. 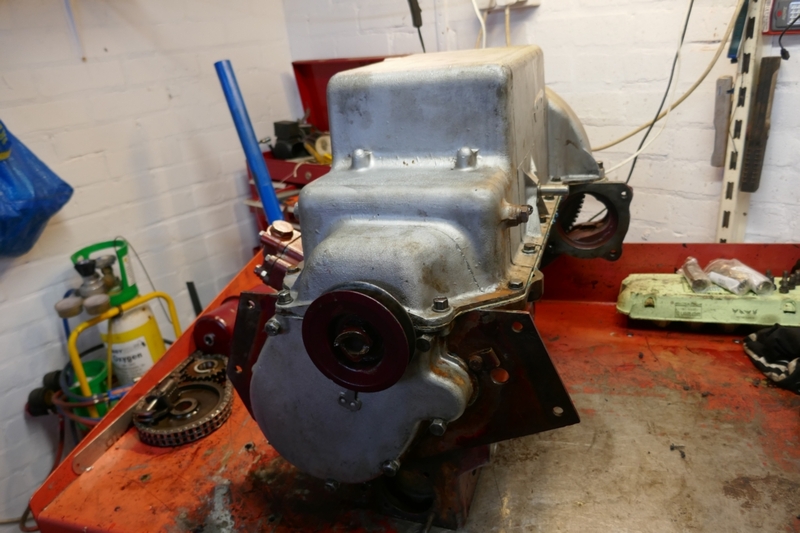 The Octogon Club don't list a starter motor so I order one with NTG. 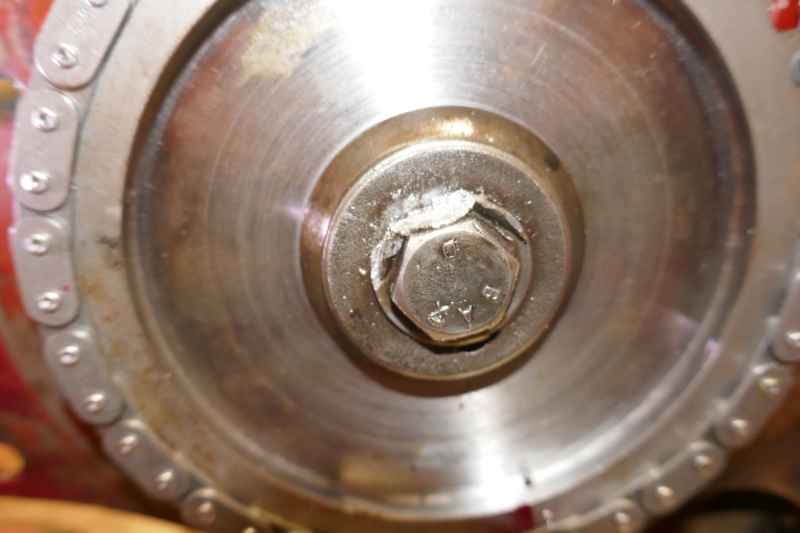 I then ring the Octogan clun and order the correct countesunk screws for the rad to casing. I was going to leave it with my hex 1/4 BSF setscrews but as I'm not putting the rad on until next week I may as well get the right screws on. This is the end of the strap after straightening and wrapping with insulating tape. Sorry it's out of focus - problem with small auto compact camera's at least the towel is in focus! The interior. The picture doesn't show the insulation crumbling but it is. The armature, in very good condition. 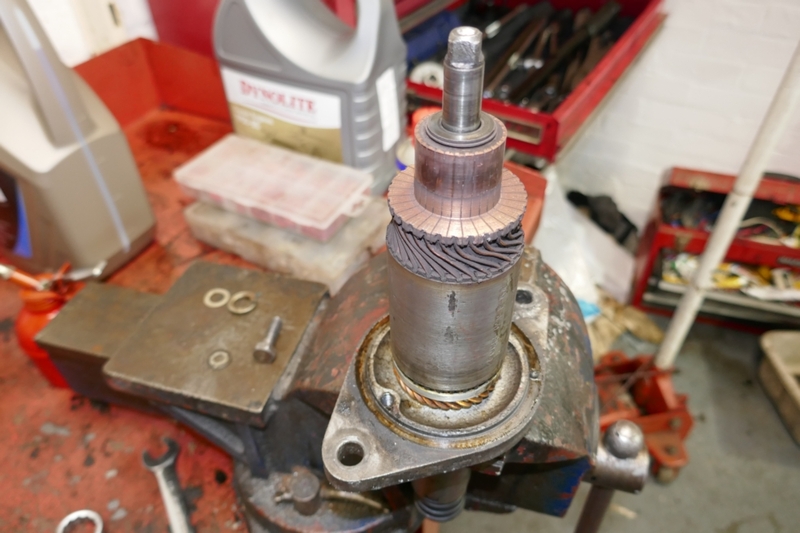 Starter motors usually last a long time, after all they are normally used twice a day, if that. Most faults can be repaired with a good clean, except aging insulation! 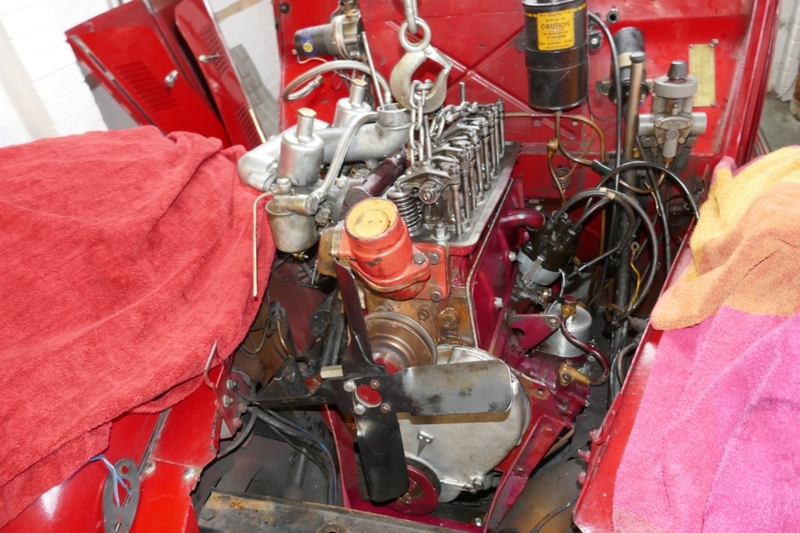 The engine raised at the front. The shiny thing on the right hand wing is my strobe light. 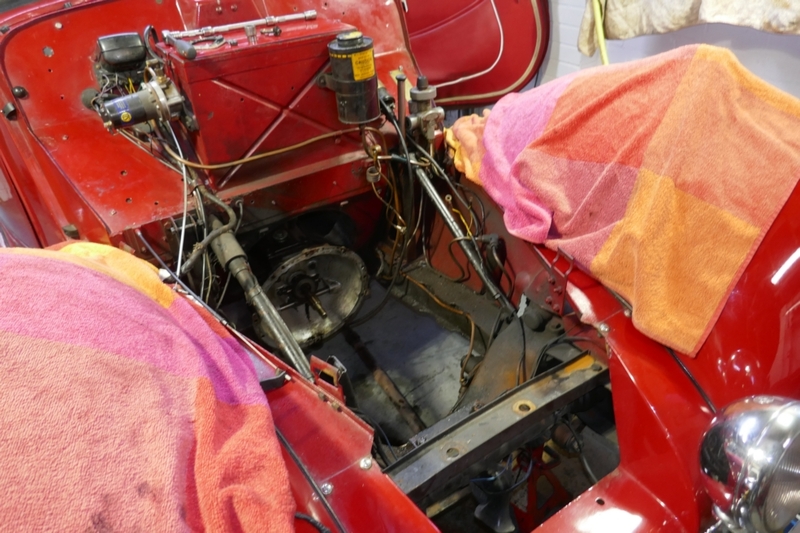 This picture is on it's side but shows the small gap between the engine and the chassis which is why the engine has to be raised to widen the gap to allow the starter to fit through. I forgot to mention that when I collected my phone from ismash, having had a new screen fitted, they had sent me a text to inform me the phone wa ready.... think about it.